The Central Park Zoo has been the home to polar bears since the 1930’s – the experience of seeing a polar bear at the zoo was to be momentarily transported into a slice of the arctic. It was also in the 1930’s that Walt Disney started creating feature-length animated films, the first being Snow White and the Seven Dwarfs. This began the tradition of Disney providing live animals to artists in the studio so that their essences could be captured most realistically. 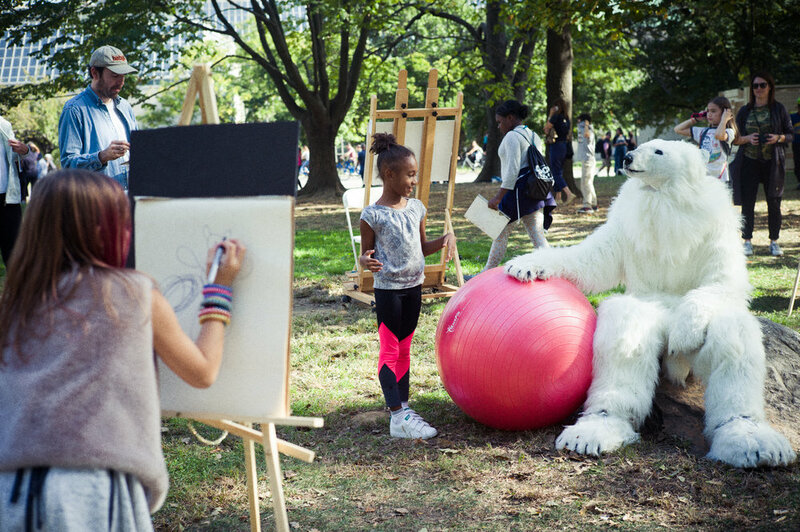 Ursus Excursus is an art “happening” that re-stages Disney’s life-drawing format, but with the subject being a human in a polar bear costume. At a later date, one looking at the resulting sketches will have no idea whether or not they were drawn from a real polar bear. This begs the question, “Does it matter?” Both Disney and the Central Park Zoo believed that real live animals had an inimitable aura about them. The intention of this piece is to highlight the threat that climate change and arctic drilling pose to the remaining polar bears in the wild by supposing a future where we have no choice but to draw reference from imitations. Central Park has been without a polar bear since 2013. Ursus Excursus was sponsored by Greenpeace, who generously donated the polar bear costume.